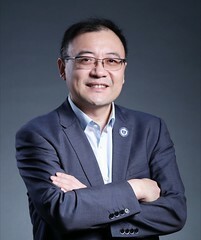 Post written by Ping-Hong Zhou, MD, PhD, from the Endoscopy Center, Zhongshan Hospital of Fudan University and Endoscopy Research Institute of Fudan University, Shanghai, China. We investigated the efficacy and safety of endoscopic submucosal dissection (ESD) of colorectal submucosal tumors (SMTs) in a large series of patients and examined its long-term outcomes in our study. Recently, an increasing number of small and asymptomatic gastrointestinal SMTs have been diagnosed via the widespread use of digestive endoscopy and advances in endoscopic ultrasonography (EUS), and ESD for colorectal SMTs is becoming increasingly common. However, large consecutive studies analyzing the long-term outcomes of using this technique for SMTs have not been reported. Our study included 412 consecutive patients with colorectal SMTs who underwent ESD from January 2008 to July 2014. In conclusion, we found that the ESD complete resection rate was achieved for 86.9%, and the rate of serious adverse events, including bleeding and perforation, was 3.2%. 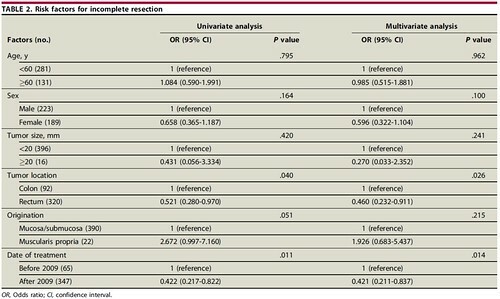 Moreover, the SMTs in the colon increased the risk of incomplete resection (19.6% vs. 11.3%) and serious adverse events (8.7% vs. 1.6%). 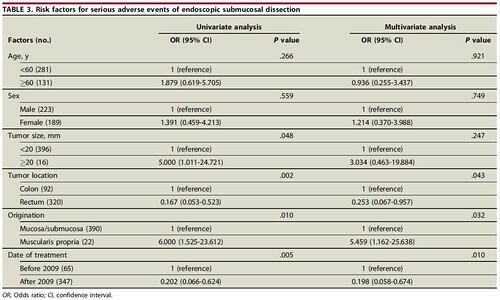 As more ESDs for colorectal SMTs were performed by endoscopists, the rate of complete resection increased (78.5% vs. 88.5%), and the rate of serious adverse events decreased (9.2% vs. 2.0%). In conclusion, ESD is effective for resection of colorectal SMTs and rarely causes serious adverse events. Tumor location and the experience of endoscopists influence the complete resection rate and the development of serious adverse events. Our results may support the role of ESD for colorectal SMTs in patients at suitable indications.